Sandra is the General Manager of Pacific Guardian Center. Prior to moving to Hawaii, Sandra was with Shorenstein Properties, then Cushman and Wakefield International. Before managing high-rise office buildings, Sandra managed a portfolio of mixed properties in the San Francisco Bay managing over 11 million square feet of R&D, manufacturing and warehouse properties mostly in Silicon Valley. For the past 25 years, Corinne has been managing commercial real estate in Hawaii. In her current role as Senior Asset Manager for James Campbell Company, LLC, Corinne manages a diversified portfolio of investment properties in Hawaii and Utah for the company and is responsible for maintaining and enhancing the value of these assets. Miles is the President of Pacific Property Group, Inc and has over 30 years of commercial real estate experience. Prior to forming Pacific Property Group Inc. in April 2007, Miles was President of Colliers Monroe Friedlander Management, Inc. for 22 years. 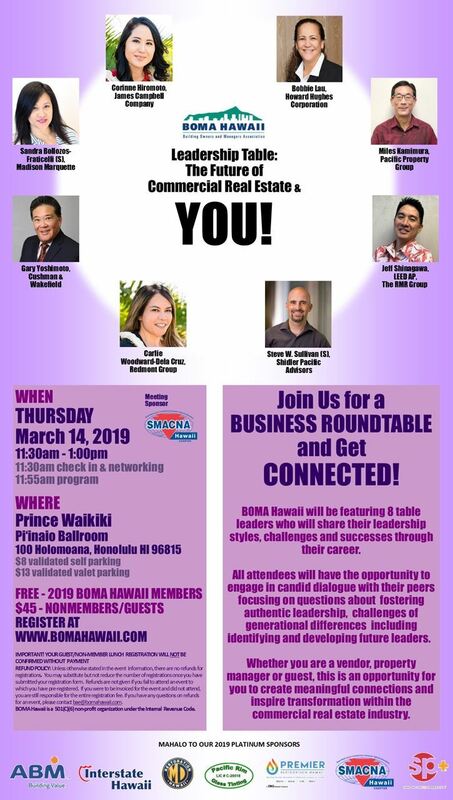 Miles has been active in local professional and community organizations, having served as President of BOMA Hawaii, and as a Board member of the HCDA. Bobbie is the Senior General Manager at the Howard Hughes Corporation and leads the asset management, property management, and operations at Ward Village. Bobbie has over twenty years of experience in commercial real estate and was previously Senior Vice President at Colliers. Jeff is the Area Director for The RMR Group in the Pacific Region where he currently oversees management and operations of over 18 million square feet of industrial property in the Mapunapuna, Sand Island, and Kapolei as well as 200,000 sf of office space at the First Insurance Center. Prior to joining The RMR Group, Jeff worked for Chaney Brooks & Company, The Shidler Group, and Colliers International. Steven is the Vice President Operations for Shidler Pacific Advisors, In addition to continuing the role of General Manger at Waterfront Plaza; he assumed the oversight responsibilities for The Davies Pacific Center, Waterfront Plaza and previously Pan Am and Tissue Genesis building. Steven has over 22 years in Commercial and residential real estate. Carlie is responsible for managing the Realty Division for The Redmont Group. She is actively involved in the strategic planning for developing and implementing the division’s growth initiatives. Prior, Carlie was an Asset Manager with Bank of Hawaii managing a commercial real estate portfolio consisting of approximately 865,500 square feet of mixed office/retail space and over 359,500 square feet of land for bank owned properties and branch leases on Oahu. Gary has 25 years of property management experience and 30 years of brokerage experience. Prior to Gary’s tenure at ChaneyBrooks he worked for Colliers International and TH Realty, Inc. He currently manages a Class ”A” office building where he services the landlord and tenants through hands-on interaction and involvement. Gary has vast experience and knowledge in tenant retention and relations, lease administration, budget development, CAM reconciliations, development/implementation of energy savings, safety systems and emergency procedures.